More than 100 nature enthusiasts came together as one on Sunday to fight threats to water bodies in the city. The decision to join hands came after an NGOs faced a threat from a fishing contractor. They held a meeting on the bunds of the Singanallur lake and discussed ways to fight such threats. Many environmentalists recounted how politicians and goons have stopped their social work and threatened them. Vowing to continue their fight to protect the water body, the 100-odd environmentalists planted 500 saplings on the banks of the lake on Sunday. R Raveendran, secretary of the Residents' Awareness Association of Coimbatore, said they did not want a confrontation. "We will hold talks with them and try to make them a part of the conservation efforts. We will gain nothing by making enemies," he said. R Manikandan of Kulangal Paathukaapu Amaippu said that when he was clearing the Athupalam canal with volunteers, several AIADMK and DMK ward secretaries came to the spot and threatened to protest. Many of them were fishing contractors. They would send men and threaten us. "We are here to help in conservation efforts as we have a passion for nature. We will not personally gain anything by clearing garbage or planting trees. This is for the community. So people need to understand and cooperate with us. In the past few decades various politicians have encroached on revenue and lake land. They also use encroachers for vote bank politics. So the entire conservation purpose gets defeated," he said. Some environmentalists said that sometimes even bureaucrats posed hurdles. "Many officials do not give us permission to conduct study or research work as they fear they will stand exposed if we find out details," said an environmentalist. Senior scientists said they had nothing personal. "We are not here to create controversy or problems. We are here to help the future generations to enjoy nature at its best. So we will continue our work irrespective of challenges and try to make the miscreants and violators a part of our efforts instead of treating them as enemies," said a scientist. COIMBATORE: Coimbatore corporation commissioner K Vijayakarthikeyan on Tuesday reviewed the Pillur III water supply scheme that will soon be implemented in the city. The commissioner held a meeting with Tamil Nadu Water Supply and Drainage Board officials and reviewed the progress. Vijayakarthikeyan said assessment had been carried out in six villages of nine villages. Once the assessment is completed, land acquisition work would begin. This project will help the civic body implement the ambitious 24x7 water supply scheme as it plans to lay pipelines from the Bhavani river. Form the current 245MLD, an additional 318MLD will be drawn daily. This project was proposed in 2015 and aims at providing 135 litres of water per person every day. Coimbatore: The 10x10foot space near the water tank at Raja Annamalai Road in Bharathi Park was the bone of contention among the residents. Some of them were using it as a convenient place to dispose household waste. As a result, morning walkers were chased by stray dogs and horses, which were attracted to the area in search of food. What's worse, due to the stench emanating from the place, the residents had to cover their nose. Now, the place sports an entirely different look. Colourful croton plants thrive there and the smell of tulsi (holy basil) permeates the air, thanks to the members of the Jawahar Nagar Ladies Association. "Deciding that enough is enough, we decided to revamp the place a month ago. Members of the association cleaned the place. But, much to our chagrin, the area was again filled with trash within a week. So, we began looking for a permanent solution that would force the residents change their habit," president of the association Anuvalentina said. "We again cleaned it up and planted crotons and tulasi plants. We wanted to make it look so beautiful that people would think twice before dumping waste there. On January 26, we planted 26 saplings there and vowed to take care of them," she told TOI. They are not alone. Several resident welfare associations and ladies clubs in the city are waging a war against garbage and are crusading to remove dumpsters from their locality. President of the Bharathi Park Ladies Association Jothi Prakash said that they have decided to remove all dump sites on the western side of the Alagesan Road and convert them into beautiful green spaces. "We have already created two such spaces  one next to the TNEB office on Alagesan Road and the other on the Seventh Cross Road near the Tony and Guy salon. We also removed weeds along the road. We have asked the residents to water the green spaces," she said. With the help of NGO Nizhal Maiyam started by B Murugan, the residents plan to replace all roadside bins  that were an eyesore and a health hazard  with green spaces. Murugan said he was very happy when the ladies association members approached him. "We have been planting saplings and wanted the residents to maintain them. So, we donated saplings and also set up tree guards around them to ensure they grow into trees. The members also ensured that all the saplings were well-grown so that public can see the visible change immediately," he said. Another NGO helping the residents is Towards A Serene Kovai (Task), which converted a dump site at Anna Colony in Karumbukkadai area. "We plan to take up five reserve sites every year and develop them into beautiful green spaces," said Task president Gurdip Singh. Secretary of the Residents Awareness Association of Coimbatore R Raveendran said the residents' crusade against garbage was a dream come true. "If every resident takes up the responsibility of his waste and their own street, the city would turn into a model that will be talked about. We hope this becomes a movement and everyone gets inspired to do similar work," he said. COIMBATORE: Going against the numerous Superme Court orders that open space reservation (OSR) land should not be used for any other purposes, collector T N Hariharan has passed an undated order to regularise OSR land at Vellanapattivillage panchayat in S S Kulam taluk here. The order issued in January, 2018 asks the block development officer, who is the special officer of Vellanaapatti panchayat, to allow an illegally constructed sewage treatment plant (STP) to function on the land, which was earmarked for a park by Directorate of Town and Country Planning (DTCP). When contacted by TOI, the collector, however, retracted the order and said that he would start the process to cancel it on Wednesday itself. "I passed the order after the high court had passed an order asking the member secretary of local planning authority to take a decision on the issue. But I would cancel it immediately and would not allow the STP to function there. STP has to be shifted to another plot nearby," said the collector. The OSR land of about 10 cents is located at a property named Flushing meadows, constructed by Elysium properties India private limited. More than 100 houses have been constructed and the owners got building approval in 2010 for 30.56acres. C P Senthil, a resident of flushing meadows said, "We bought the property three years ago. When we came to live here, the construction of the STP had begun. But we did not realise that they were doing it illegally on OSR land. When we got to know, we filed RTI applications and collected all the details. We held meetings with the property developers and also appealed to the district collector and other officials to take appropriate action, but no action was taken." Following this the residents had moved to the high court. It had passed an order in 2016 that the construction was illegal and it could not be permitted. However, since it was for the public purpose, the court had asked the member secretary to check if there was any way it could be regularised within a month. The member secretary inspected the site but did not pass any orders. However, later based on complaints from residents, the village panchayat and the block development officer inspected the STP and noted that it was not functioning as per norms. In September 2017, the BDO passed an order that the STP would be sealed. But residents of the property petitioned the BDO against the order after which the BDO wrote to the district collector. "The assistant director of village panchayat had asked for an opinion from member secretary on this issue. In the letter the member secretary, Dhanraj, has clearly stated that there was no scope for regularisation. He said the village panchayat could act as per government norms," said S P Thiyagarajan, an RTI activist. "The district collector passed an order in January asking the BDO to regularise the unlawful STP. This cannot be allowed as there are various Supreme Court orders that an OSR land's purposes could not be changed for any reason. These are the lung spaces and they should be used only for the purpose they were specified for," Thiyagarajan added. The district collector told TOI that legal experts had already spoken to the residents and action would be taken as per the norms. Environmentalists in the city have sought a change in government policy to save the wetlands in urban areas and called for a need to create buffer zones around them. "We cannot keep cleaning them every weekend forever. There needs to be a strong policy and it needs to be implemented. Only then the lake conservation can be a sustained effort," said a city-based scientist. V S Vijayan, former director and founder of Salim Ali Centre for Ornithology and Natural History, said that the government had to come up with a strong policy to ensure that illegal activities around the lakes stopped. "A buffer zone should be created and rules need to be framed on what sort of activities will be allowed. Minimum of 500 feet is required but the government should increase the area of this zone," he said. He had recently submitted a report to the city corporation commissioner urging the government to ensure farmers around the lake undertake only organic farming and avoid the use of pesticides. "The fishermen community should be involved and rules should be framed for them. Residents should not be allowed to pollute the lake in the buffer zone and strict action should be taken against violators," he said. Talking about sewage entering into the lake, city-based environmentalists said that it was a national problem. Sewage treatment plants and big infrastructural projects was the need of the hour. "People need to realize that lakes are not dumping sites but are the last resort to save urban bio-diversity," said Joseph Reginald. Environmentalists said unless policy level changes are made, their efforts will not reap benefits. "Most times, we clean a place and then find it stinking with garbage again. Unless, the government takes it up and enforces laws it becomes difficult to sustain our efforts," said a volunteer. District forest officer N Satheesh said with 50% of the world population living in urban areas, wetlands are an important aspect of sustainable future. "We should protect them as they are the shock absorbers whenever calamity strikes us," said Satheesh. Coimbatore: The public works department has sought Rs 207cr to develop Noyyal River and water bodies around it, a move that will give an infrastructural boost to the entire river system. The fund is sought under the Cauvery modernisation scheme that was announced five years ago for which the central government had sanctioned more than Rs 11,000cr. "Noyyal river is a tributary of Cauvery and joins the river at Karur after passing through Coimbatore, Tirupur and Erode. Since it flowed only for 10 days a year and was on the brink of extinction, we decided to take up its rejuvenation under this project," said a senior PWD engineer. The department had sent a detailed proposal to the central water commission with the demand. "The state government and the central water commission have sought some changes and corrections in it. Once that is finalised, we will start work on the detailed project report by undertaking surveys and studies," said an official. The funds will be used to set up concrete walls on the sides of the supply channels for a distance of 158km from the river's starting point till it joins Cauvery River at Karur. All the tanks in the course of the river will be strengthened and revived. "We will clean them, de-silt them and strengthen their bunds. Parks will be set up and the water bodies will be renovated," said an official. Officials said that totally, 20 anicuts will be renovated and 28 tanks will be rejuvenated. "We have undertaken surveys and visited the sites to find out what the problems are and what infrastructural solutions can be implemented to revive the river and its channels," said an engineer. The city corporation had already taken up eight water bodies under the smart city project with plans to revive them. "The Cauvery modernisation scheme was announced five years ago. Noyyal River is also a tributary of Cauvery. So, we decided to add it and send a proposal. It will take one more year for the detailed project report to be completed. A special project wing has been created for this purpose, that is undertaking studies," an official added. Sweet revenge for residents as HC directs city corpn to clear garbage TNN | Feb 7, 2018, 00:53 IST Coimbatore: When the city municipal corporation sent property tax notices to the residents of Co-operative Colony in Uppilipalayam, it received a strong message in return—clear garbage from the area first. Corporation's sanitary workers were not collecting garbage from the area—which has about 150 houses— for the last six months. Mounting garbage and lack of civic amenities in the colony forced the residents to file a petition in the high court. The case was filed when the corporation officials forced them to pay Rs 60 as garbage collection charge along with property tax. Their tax payment was not accepted until they paid Rs 60. "But, we were not willing to pay the charges as civic workers never came to our colony. We made several representations to the city municipal commissioner, but no action was taken," said secretary of the Co-operative Colony Resident Welfare Association R Manoharan. The situation prompted the residents to collect Rs 150 every month from each household and use the money to pay a man, who collected garbage. Later, when they wanted to set up a pathway using their own fund and sought permission from the corporation, there was no response, Manoharan said. "Our request to set up speed-breakers in the area was also met with silence. After all that, when they imposed these charges, we decided to take it up with the court," said Manoharan, an advocate by profession. The high court on January 4 ordered the city corporation commissioner to consider the residents' petition and pass orders based on the merit within two weeks. Corporation officials told TOI that they have started sending sanitary worker to the colony. "There was some miscommunication. It has been resolved. Workers are going to the area regularly for the last one week," said an official. TIRUPUR: The Power Grid Corporation of India's mega project of linking Tamil Nadu's Pugalur and Chhattisgarh's Raigarh has earned strong opposition from farmers in western districts of the state. The farmers raise concern about high-voltage transmission lines affecting their livelihoods. The farmers have urged the central and state governments to execute the project by laying underground cables instead of high-voltage transmission towers. The Rs 5,700-crore-project will include the whopping 1,830-km link to connect southern states with the northern states, and the link will be able to transmit 6,000mw of electricity. The link will cross 15 districts in Tamil Nadu. In case of Tirupur district, an electrical station is being established at Pugalur near Kundadam. Five mega transmission lines from Arasur and Edaryarpalayam and Maivadi of Coimbatore district, Thrissur of Kerala and Tiruvannamalai were likely to reach Ichipatti. Still more transmission lines from various other places may reach the substation, said N S P Vetri, working president of Katchi Saarbatra Tamizhaga Vivasaigal Sangam. The transmission towers will be established across thousands of agricultural lands in the state, for which small places needed for building towers would be acquired. If so, there would be numerous restrictions to the farmers in utilising or cultivating in their own lands located beneath the transmission lines. So, the lands will lose their market value, said Vetri. "It would affect the micro farmers the most if transmission lines bisect their lands. The authorities have said they will provide compensation of around Rs 20,000 per site where the transmission tower would be erected, and also the same amount if a coconut tree should be chopped for the project. 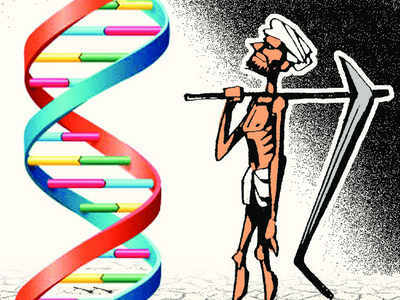 But it would not weaken the farmers, who were already in grief," said Gopal of Parambikulam Aliyar Project Irrigation Scheme Welfare Association. While the states like Kerala has planned to provide transmission lines by laying underground cables, why the same should not be followed in this project. They can lay the underground cables along highway roads. The underground cables may be costlier than the upper transmission lines but it would save the farmers, said Vetri. Coimbatore: Hardly a week after TOI reported about the plight of the Mill Road, the city corporation has started repairing it. "We had dug up the stretch from Sukarwarpet Junction till Gandhi Park to lay underground drainage pipelines. We also replaced water pipelines that were very old. But, we did not lay the road as it was part of a scheme. Since there were several complaints and news reports about the bad condition of the road, we decided to patch it up. We will make it motorable and then lay the road after a few weeks," a corporation official told TOI on Sunday. The stretch from the Vadakovai Junction till Sukarwarpet Junction comes under the state highways department, while the stretch from Sukarwarpet Junction till Gandhi Park Junction comes under the city corporation. The stretch from Gandhi Park Junction (Thadagam Road) is a state highway connecting Anaikatti. Last laid 20 years ago, the road has always been filled with potholes. "Even now, they are conducting just a patchwork. I want them to re-lay the entire stretch, because this is one of the major junctions in the city. It connects R S Puram to the Poo Market and the Town Hall. It is also one of the major stretches connecting Avinashi Road to Thadagam Road. The corporation had turned a blind eye to this road for more than a decade," said Mohan A, an auto driver. Expressing his happiness about the road work, Arpit Bothra, a commuter, said the ride on the road was backbreaking. Shruthi R, a homemaker, said accidents were frequent on the stretch due to potholes. "There were several potholes that were nearly one feet deep causing traffic congestion. Buses, lorries and cars that tried to avoid the potholes made it worse for two-wheeler riders," she said. City corporation officials said that they will re-lay the road soon. "The road will be re-laid after the patch work is done. Several roads are to be laid across the city and they are all a part of a package. Once that is sanctioned by the state government, we will re-lay them," said an official. Coimbatore: The city crime branch (CCB) police on Saturday arrested a 45-year-old man for siphoning off Rs 35.37 lakh from the bank accounts of GV Residency Association and GRD Residency Association. N Dhandapani from Kannan Street, who is the secretary of the PSG Co-operative Housing Society, was arrested after the secretary of the GV Residency Association and GRD Residency Association, CR Swaminathan, filed a complaint against him. 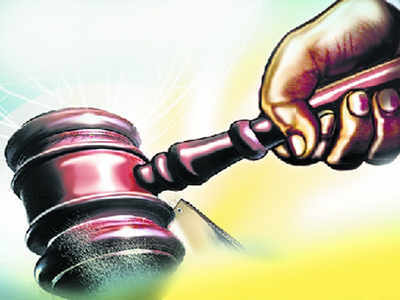 In connection with the case, police have also registered a cheating case against the special officer for PSG Co-operative Housing Society, P Sundarraju, who is absconding. "PSG Co-operative Housing Society was started with the aim of providing housing facilities for the employees of the PSG Institutions in 1985. The society promoted housing projects at Uppilipalayam near Singanallur and Vilankurichi. Residents in Uppilipalayam started GV Residency Association and residents of Vilankurichi started GRD Residency Association in 1991. But, they were not registered. I was elected as the secretary of the two associations and GR Karthikeyan was elected the president. The associations were not functioning under the PSG Co-operative Housing Society and had separate bank accounts," Swaminathan's complaint said. GV Residency Association had opened a bank account for Sri Dhana Ganapathi temple located there in November 1999. "V Rajan took charge as the president of the associations in 2000. Dhandapani, who was appointed as the secretary of the PSG Co-operative Housing Society, used to manage the bank accounts of both the associations and the temple. I was busy with work and was not able to monitor the bank transactions," Swaminathan said. "Sundarraju was appointed as a special officer for PSG Co-operative Housing Society in July 2012. Dhandapani and Sundarraju hatched a criminal conspiracy and transferred Rs 35.37 lakh from the accounts of the two unregistered associations and the temple to their personal accounts in various instalments from October 13, 2012 to October 21, 2016. We came to know about the misappropriation of funds only recently," the complaint said. Based on the complaint, CCB police arrested Dhandapani on Saturday and remanded him in judicial custody. Police have registered a case under Sections 120 B, 409, 468, 471 and 420 of the Indian Penal Code. Coimbatore: The city corporation will carry out restoration work on 72 roads at an estimated cost of Rs 6.8 crore. The patch-up work, which began on February 10, will go on for another 10 days. They plan to cover all the stretches that were damaged due to laying of pipelines and electric and telecommunication cables on roads. The Tamil Nadu Urban Road Infrastructure Project has sanctioned funds to the corporation to carry out this work. “We will be using a part of the corporation fund as well for this work. We had collected an amount from residents while laying underground drainage and water pipelines. That fund for road restoration will be used when selected stretches will be re-laid,” said an official. According to corporation officials, some areas such as Kavundampalayam and Veerakeralam will be dug up by the Tamil Nadu water supply and drainage board for laying Siruvani pipelines. “So these areas will not be taken up for road restoration. Patch work on these roads will be carried out after the pipeline work is completed,” said an official. Similarly, patch work will not be carried in areas such as Sarvanampatti, Chinnavedampatti and Kalapatti. In the west zone, the civic body will patch up roads in areas such as R S Puram, Saibaba Colony, D B Road and Bharathi Park Road at a cost of Rs 2.7 crore. In the north zone, roads in areas such as Ganapathy and Thudiyalur will be patched up for Rs 1.30 crore. In the central zone, Gandhipuram, R G Street, Raja Street and Oppanakara Street will be patched up for Rs 1.3 crore. In the south zone, seven roads will be patched up at a cost of Rs 51 lakh and in the east zone10 roads will be patched up for Rs 89 lakh. Totally, Rs 6.80 crore will be spent on 72 roads only for patch work. “After the patch work is completed, we will re-lay some stretches under the TURIP fund,” said an official. In the city, the corporation had spent more than Rs 50 crore and laid roads before the 2014 state assembly elections. Since then, some roads were taken up for re-laying after they were dug up for underground drainage pipelines. Coimbatore: Residents besieged the Othakalmandapam panchayat Office on Thursday after contractors stalled the drainage construction work on the Nataraja Gounder Layout. The panchayat had sanctioned Rs 1cr to lay roads and construct drains in the 1km stretch in the residential area. The work began 10 days ago. The workers dug out the roads to construct drains. At one particular stretch, four house owners objected to the drain constructed in front of their homes. “They used political pressure and their connection with the local legislative member to stall the work. On Thursday morning, they closed the drains that had been dug out by filling them with sand,” said V Kalpana, a resident. As per Selvakumar, another resident in the area, the gradient of the road was such that the drain had to be constructed on that stretch. “The road runs east-west and the drain has to be constructed on the left side for the water to flow without any blockage. But, these four house owners are using political pressure and all the other 100 houses have to suffer,” he said. The executive officer of the panchayat and the other local engineers had already approved the design and ordered the workers to complete the work. “Everyone in this area has connections with AIADMK. We cannot understand how they can use their political influence for such purposes,” said Shanmugam, a resident. The residents said that for more than a week, they did not get water supply as all the pipelines in the area had been damaged when the roads were dug out. “This is a government project and the officials are executing it based on the technical expertise. How can they change the direction of the drain based on their whims and fancies,” asked S Valarmathi. Coimbatore: With the days getting warmer, are you forced to shell out as much as Rs 20 on a bottle of packaged drinking water every time you step out? Soon, you will be able to leave home carrying just an empty bottle and fill it with purified water for just Rs 5 at any of the 40 kiosks that will be set up by the city corporation. All major bus stands, parks and crowded junctions in the city will have the kiosks, corporation sources told TOI. The kiosks will have a reverse osmosis plant (RO plant) that will purify water. The water will again be tested for suspended particles and chlorine content. Implemented under the smart city project, the project aims to provide affordable potable drinking water to the people. The proposal for the project has been submitted to city corporation commissioner K Vijayakarthikeyan, a corporation official said. “The commissioner will take it to the board in the coming weeks and after it is approved, tenders will be called,” he said. A survey revealed that while the city residents received enough drinking water, the transit population was not provided with enough water, the official said. “There is a huge gap. The commuters have no other choice but to buy bottled water. If such kiosks are set up in all locations, it will help the migrating population,” he said. The kiosks will be set up under private-public partnership, where the corporation will provide water. The company that takes the contract will have to set up the RO plants and the kiosks. They will also spend on the maintenance. The company owns the revenue made from the sale of water. In Chennai Central Station, passengers are able to fill a water bottle at just Rs 5. Other railway station in the country charge between Rs 2 and Rs 4 for filling a bottle. “Such kiosks have also been set up at Tiruchy and Tanjore railway stations. We have studied the models and will implement it soon in Coimbatore,” the official added. 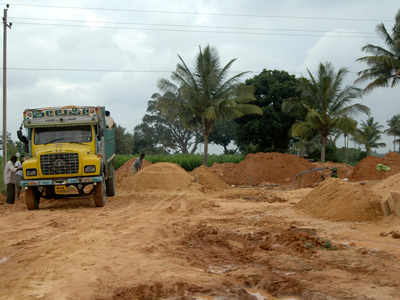 Tirupur: District revenue officials seized nine trucks, laden with imported sand from Malaysia, in Udumalpet on Friday. The sand, imported through Cochin port, was being taken to Palani in Dindigul district. The trucks were seized as the government has recently banned the direct sale of imported sand. However, the importer was presumed to have obtained permission to import and sell the sand within Kerala. As per the Tamil Nadu Minor Minerals Concession Rules, 1959, no one should procure sand from the other states and sell them in Tamil Nadu without the permission of the public works department (PWD), which will give nod only if quality of the sand satisfies its specifications, and vice-versa. Recently, the Thoothukudi district administration seized the sand imported from Malaysia, forcing the importer concerned to approach the Madurai bench of the Madras high court. So, keeping the public safety in mind, the state government passed an order dated December 8, 2017, banning direct sales of imported sand without the nod of PWD, said a senior official from the geology and mining department. “We noticed that nine trucks bearing Tamil Nadu state vehicle registration numbers were carrying the imported sand. Further enquiries revealed that a Kerala-based company imported the sand from Malaysia and they were being taken to be sold in Palani,” Udumalpet tahsildar Thangavel told TOI. Since it was illegal to sell the imported sand without the knowledge of PWD, the trucks, which contain 3 units of sand each, were seized by the Udumalpet revenue divisional officer as recommended by the geology and mining department, said Thangavel. “The importer was presumed to have paid GST on the consignment and also obtained permission to sell them within Kerala. The trucks were too having transit passes but it was illegal to transport the sand without waybill of the state’s PWD in Tamil Nadu,” explained another revenue official.